When Larry Kennel bought his property outside of Mt. Joy, Lancaster County, he never envisioned what was in store 30 years later. A veterinarian by trade, Kennel had the perfect land and building for boarding cattle to perform embryo transfer, which was his specialty. However, the land was also good for something else, and in 2009 Kennel planted grapes for his vineyard. Four years later, the Vineyards at Grandview opened. That “shot” became a second profession, something spurred on when his veterinary practice slowed, although the passion of making wine may have helped his decision. “It was a hobby that turned into a full time job. I am retiring to a full time job,” he said. Whatever the reason, the Vineyards at Grandview is a recommended stop for any local wine connoisseur. It was the second time that my wife and I visited the place located along a country road between Marietta and Mt. Joy. You can see the vineyards from the road heading in, and what looks like a simple building from the outside, houses a production area and nicely decorated tasting room. Kennel, his wife, Marilyn, plus two daughters and sons-in-law are all a part of the day-to-day operations. The family had a large deck built outside the tasting room overlooking the fields and setting sun, perfect for the unseasonably mild December day we were there. Our experience was outstanding. Similar to nearly every winery we have visited over the years, the staff was friendly as we stood at the hand-made wooden tasting bar. But with all the nice decorations, the thing that catches the eye is the brick wall, from which a large iron wine rack holds the various varieties for sale. Kennel said that wall was the idea of one of his daughters, and it really sets the place apart. As is our custom, we tasted several of the wines, many of which were somewhat surprising. We – especially my wife Gail – tend to be sweet wine fans, but try to sample a decent variety. The sweet Ruby Red was very good, yet different. Many concords resemble an extra flavored grape juice - which we like - this did not, and it was still delicious. Gail really enjoyed the Sapphire White, a tasty sweet that could compliment a meal or a night by the fire. 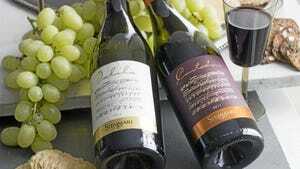 There is also the trio of fruit wines, called the Heritage Collection. In this group you will find a tasty Pop Umble’s Black Jack Cherry, which is aged in the barrel of a “well known” non-wine product. The Mom Kennel’s Blackberry is named for Larry’s grandmother, and gets its flavor from her recipe for preparing the fruit. This stuff is made to drink with chocolate. One thing we noticed was every wine sampled had a smooth, clean finish. This included the Pinot Gris, which is in its first year at Grandview. Even the Pinot Noir, a wine which to me sometimes carries an overbearing oak flavor from the barrels it is aged in, was really good. Still dry, the Noir’s was crisp with no aftertaste. 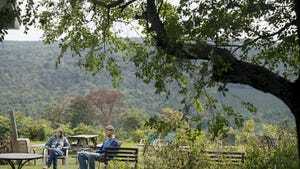 The property extends down towards a creek and a cove area, where they host weddings during the warm months. Pretty on the unseasonably warm December day we visited, in bloom this area must be beautiful. Featured wine – Grandview has a wine named the Norton, an off-dry red made from Norton American grapes that are grown primarily in Virginia and Missouri, although Kennel gets ones for Grandview’s use from a grower in Schuylkill County. The Norton smells and tastes terrific, with an outstanding finish. Kennel uses a little bit of sugar that tones down the acid. He has recently barreled a port from the Norton in 2016. “It really is a food wine,” he said. “We mix in about 19 percent Merlot, just enough to give it the extra tannin for the finish. That alleviates some of the tartness. Whatever it does for the wine works. Once again a local winery had me purchasing something I wouldn’t have expected. But this dry red is perfect with food, especially our Christmas Dinner. Hours and events: Fridays from 1 p.m. to 9 p.m., Saturdays from 11 a.m. to 5 p.m. and Sundays from noon to 4 p.m.
Live bands perform at the winery on many Friday nights during the summer months. Kennel said that Grandview has 18-20 weddings scheduled for 2016. A full list of events and other information can be found at http://www.thevineyardatgrandview.com. Nearby attractions: With nearly all of Lancaster County to the east of the Vineyards at Grandview there is plenty to do to make a day or two of things. From the tourist areas of Lancaster, rich in Pennsylvania history, to the shopping areas, and several county parks. You can tour the Amish Country or even head a short drive to the attractions in Hershey. The winery is not far from the popular Chickies Rock County Park known for its hiking trails and spectacular views of the Susquehanna River. Also not far is the well-known Bube’s Brewery and Catacombs Restaurant, a fun place for a nice dinner, drinks or a themed feast with friends. Being in an area of tourist interests, there are hundreds of hotels to choose from, but also many bed and breakfasts. In fact, a mere few miles from Grandview are several, including the Victorian Rose, the Rocky Acre Farm, and the pre-Civil War Hillside Farm.